Lattice work is used as filling or for backgrounds. Worked on a plain ground (with only the fabric behind the lattice stitches) it can be easily managed by beginners. Adding a colored background (for example, a background worked in satin stitch) kicks the stitch up a notch to intermediate level. 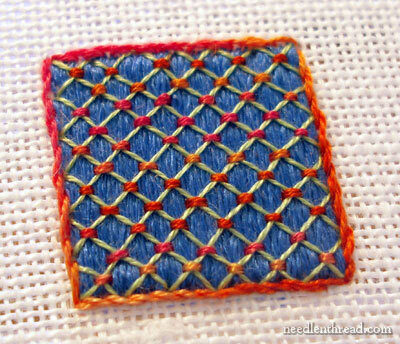 Here’s a video tutorial on working lattice stitch over a satin stitch ground. Whether you decide to work lattice stitch over another layer of ground stitches or right on top of the fabric is up to you, depending on what effect you want. The principles for the actually lattice part of the technique are the same: lay down your crossing threads, then couch them at the intersections. In the video below, I’m taking you through the satin stitching for the background of the lattice work, and then laying the lattice threads, then couching them, and finishing with a decorative border. Here’s the result of the piece I’m working on in the video. It’s about an inch square. Since I’m working with untwisted silk threads (flat silk) for the blue background, I cover some techniques of working with these threads in the video. A few notes about the video itself, before you launch in: 1. It’s rather long – almost 10 minutes; 2. The sound is just slightly “off” – after editing the video and sound three times and saving the file to check again and again, I finally had to leave it as it is. It’s not too bad, but you’ll see me doing things right before you hear me talking about them! Sorry about that! Although I would classify this as an intermediate technique overall (especially when embroidering the background in satin stitching in flat silk), it is still accessible for beginners. It just takes patience! You can certainly stitch the background with other threads – and you can simply use a filling stitch such as long and short stitch, instead of satin stitch. Experiment with it! And, while this is worked on a square, keep in mind that lattice stitching can be used to fill any shape or background. For more video tutorials, please visit the my collection of how-to videos for hand embroidery here on Needle ‘n Thread, where you’ll find over 70 hand embroidery videos to help you learn a variety of stitches! Do you ever use a laying tool? If so, when? Thanks for posting this and all the rest very helpful!Your work is awesome!. I am gonna link you to my blog. Gracias, muy linda puntada y clara su explicación. Thank You So Much! Just got a new project and wasn’t feeling too confident but your video lesson has helped me feel much better. Previous Previous post: Working with Silk Thread – Hand Cream for Embroiderers!